The admirers of his work have already become accustomed to his unusually colorful panels, but the landscape here is extremely beautiful. A poppy is a flower of sleep and love. His scarlet color always tells us about the brightness and transience of love and its rapid flight in human life. And the fact that the poppy is able to lull the mind has been known since ancient times. Klimt, almost for the first time turned to the landscape, but how beautiful it turned out. See how many different flowers there are, but poppy dominates. He does not let the daisies or cornflowers or violets show themselves. He is above them, like a king over his subordinates, and even the bushes, which are depicted on both sides, are not able to push back the beauty of the flowers. 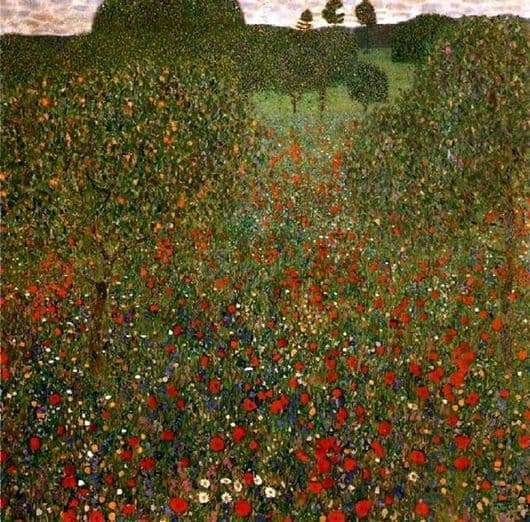 Klimt consciously draws only a glade with poppies and practically does not pay attention to the sky and the horizon. What for? The main thing is poppies! Klimt here sacrificed his style a little, quite a bit, but still the “carpet” of flowers remained. Remember his “Kiss.” After all, there you won’t immediately understand what’s what, because everything is eclipsed by a magnificent flower ornament on a man’s raincoat. Here, on this canvas, the same. All overshadows floral living ornament of poppies and other beauties of the meadow. It turns out as if the path of flowers, which begins right from the front edge of the canvas, and ends somewhere deep inside the picture. By the way, another dissimilarity of this work with others – here he writes for the future. Here everything is calculated on the distance and angle of view of the public. But the canvas is really so realistic that I just want to smell and catch the charming smell of a forest or garden glade. After all, poppies themselves do not smell, their lack of smell can very well compensate the rest of the “population” of the field. And yet the color scheme chosen by him is true: green and red colors create feelings of peace and joy. Perhaps that is why it is always a pleasure to look at this canvas.